My family and I just got back from our annual trip to Oklahoma for the 22nd annual Oklahoma Gold Rush. It is a Grand Prix style motorcycle race that is held outside of Tulsa every year. My folks still live in OKC so it makes for a great “2 birds/1 stone” situation. I will write all about the motorcycle part of this trip in my Highland Cycles blog HERE but what I am writing about today is the moment of terror my wife and I experienced while we were there. Motorcycle racing is dangerous. There is no doubt about that but this weekend proved that its not just being on the bike that can get you. My son Ewan is 8 years old and just an absolute joy to be around ALMOST all of the time. Lets be honest, kids have their ups and downs. Anyway, we all raced on Friday night without any incident. 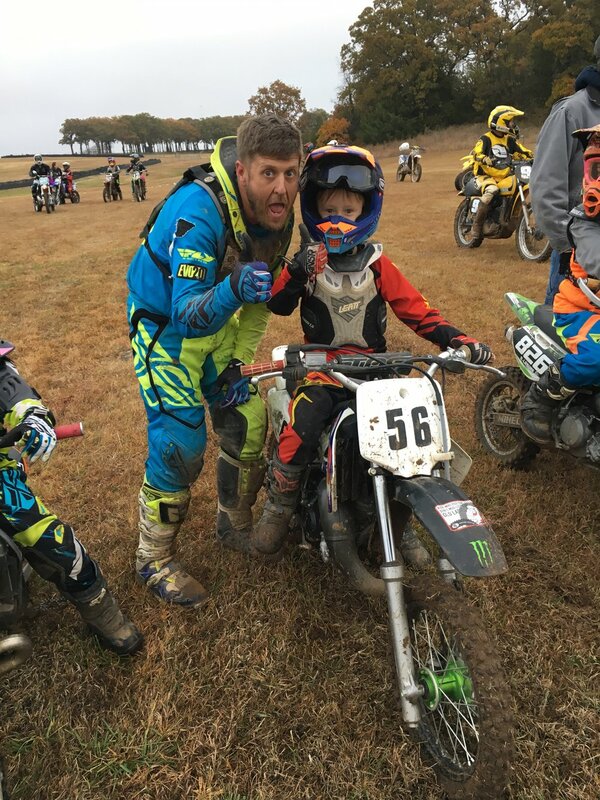 The boys raced Saturday morning and had a great race with no problems and then it was my turn. We had a 2 hour Grand Prix and I was gunning for a win in my class. The flag waived and I pinned it. I wrote a pretty good account of that race HERE. As the race came to a close I ended up in 3rd and ahead of my buddy (which was my only REAL goal) by about a second. This is when things went sideways! I crossed the finish line pumping my fist in the air (as if I had accomplished something big). I was psyched with the result and ready to high five my friend and celebrate another safe race. I hopped off my bike and as I was putting the kick stand down when my friend came in a little hot, grabbed too much front brake and dumped his bike. This alone would have been no big deal and par for the course but my son Ewan was running up to give me a hug and was hit by the crashing motorcycle! The way it hit him swept his legs out from under his 8 year old frame and his head hit the asphalt really hard. I watched as his eyes went completely blank. They were open but no one was home. Terror is the only word that comes close to describing the feeling that came over me. A pit opened up in my soul and in my wife’s too. Fortunately God was with us and in less than a second (though it seemed like eternity) he began to cry. It is amazing how beautiful a cry can sound! My wife scooped him up in her arms as the EMT’s came over to check him out. To be safe they took him into the ambulance to give him a full check over and make sure there wasn’t anything really wrong. After a few minutes they cleared him and told us to watch out for symptoms of brain swelling. Unfortunately I am VERY familiar with concussions so I knew what do look for. We headed back over to our pit area and Ruth cuddled that boy with all of her heart. She had been incredibly calm and collected in the moment but now as she held Ewan in her arms she began to cry. I scooted up next to them and held them both and we wept. We knew that he was going to be just fine and that it was all just an accident but the gravity of what COULD have happened came over us as the adrenaline wore off and we had time to think. The human is an amazing machine! We can spring into action and get all of the necessary and life threatening things taken care of before we really even think about the situation. Then as things calm down we find empathy, concern and love and we nurture and take care of the emotions that have come to the surface. God has made us so wonderfully complicated and efficient! Stay tuned for the next hiccup we had on our trip!! Thanks so much for reading my words. I am really enjoying this new project. If you like it, please share it. This is going to continue to be a look into a real, messed up, flawed but joyful human’s life!! And if you want to check out my Highland Cycles blog which is ALL about motorcycles, click this button!